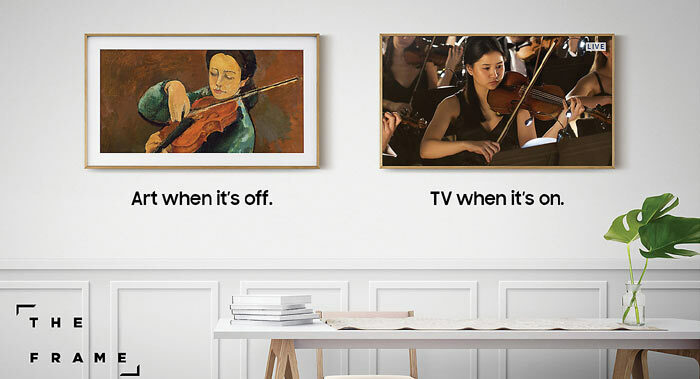 Samsung has emailed HEXUS to let us know that its Lifestyle TV product dubbed 'The Frame' is now available in the UK. If you head on over to the official The Frame UK web page, Samsung will ask you to fill in a web form to get the latest sales and news about this product. That page says 'coming soon,' and we were told the same. If you are interested this arty TV will be sold via the Samsung web store and selected retailers from £1,999.99. There are 55-inch and 65-inch versions of this 4K Ultra HD TV. What is The Frame? 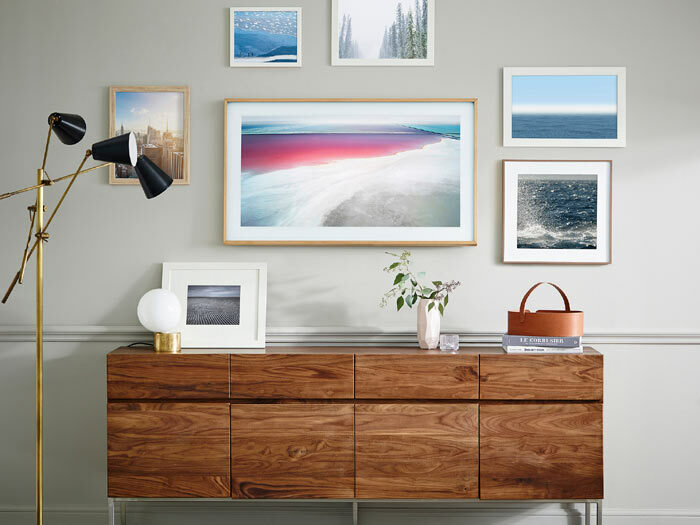 In the picture above you can see a large central picture frame with an image of waves lapping the sea shore - this is Samsung's lifestyle TV product. When not in use as a TV it will, instead of fading to a black screen, display art and / or photos. Samsung says that there is a built-in choice of 100 pieces of art by renowned artists that have been commissioned and selected by the company. Samsung will also allow access to its Art Store for a one-off £14.99 fee or monthly £3.99 subscription. Currently the Art Store contains 300 pieces. 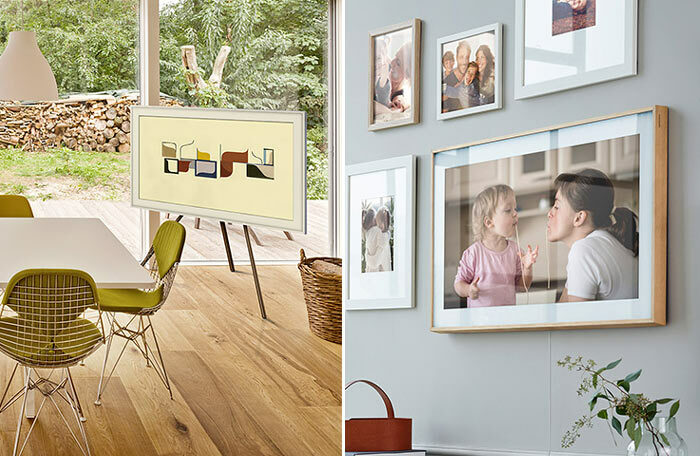 Should you want to display your own art or photos, that's an option too. The Frame has a 2GB 'My Collection' folder where you can upload your own images. It seems that wires won't be necessary to manage the art and 'my collection' folders. Samsung's TV has a Smart View mobile companion app where art, images and other things like colour settings, ambient light sensing, and making the TV display switch off when users leave the room, can be adjusted via Wi-Fi. Samsung's The Frame is available with walnut, beige and white bezels, which snap on and off to fit in with your room decor. A no-gap wall mount enhances its looks, and if you can't embed the cables in the wall the transparent optical cable (5m) pairing with the One Connect box adds to the seamless visual appeal. The Frame won the 'Best of Innovation' award at the 2017 CES, and was designed by Yves Behar. Isn't that an amazing waste of energy? I don't think the target market will care too much about the energy consumption. I think I'm the target market, but I am concerned about energy consumption. But first off, TV's aren't e-ink, having a back-lit image is not relaxing. Well if they're using Super AMOLED, they could make a very high quality low power image. A lot of the power consumption in TVs is because of the image refreshing but if they're just a static low power image it would be assumed that the consumption would be in the low watts range. They don't need the vibrancy and depth for the video output so that's a whole heap of processing power slid off the table already. In this case it's best to not think of it as a TV when it's in that mode and instead as an eframe of which have very low power thresholds. The screensaver is a waste, but I like that its a dedicated option for wallmount TV fans. Fits in much better. If it was AMOLED I would worry about that white border burn in.